In stock -This product will ship today if ordered within the next 2 hours and 12 minutes. 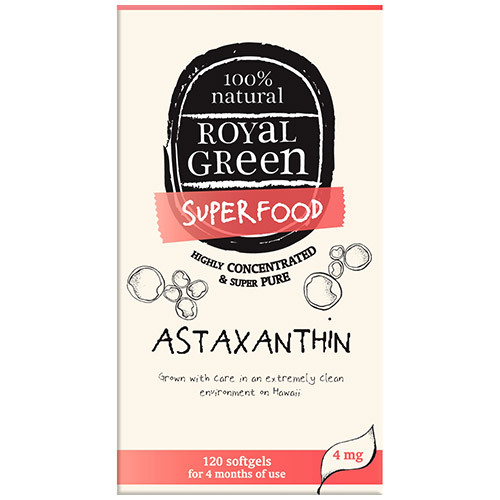 Royal Green Astaxanthin is one of the most powerful antioxidants available, helping protect against free radicals and supporting immunity. Royal Green Astaxanthin is grown in a clean environment in Hawaii and is 100% vegetable based. Astaxanthin belongs to the carotenoid family and is one of the most powerful antioxidants available. It is 64 times stronger as an antioxidant than vitamin C.
Safflower oil (Carthamus tinctorius), softgel (gelatine, water and glycerine), Haematococcus pluvialis algae, Vitamin E (D-alpha-tocopherols). 1 softgel per day, preferably with a meal. Do not exceed the recommended daily dosage. Keep out of reach of children. As with every dietary supplement, consult an expert before use in case of pregnancy, lactation, illness or medicinal use. Below are reviews of Royal Green Superfood Astaxanthin - 120 x 4mg Softgels by bodykind customers. If you have tried this product we'd love to hear what you think so please leave a review. Excellent antioxidant in a very convenient daily dosage to take. Highly recommended.